It’s a well known fact that I love Citrus and Coconut. So when you put them together…WOWZAH!!! I stumbled upon this recipe on one of my many “research” nights and was instantly drawn in because of its two main ingredients. Sounds like a winner to me! And the icing on the cake? Simple, easy steps. Combine those factors and this gal was a HAPPY CAMPER! And friends, it really was delish! 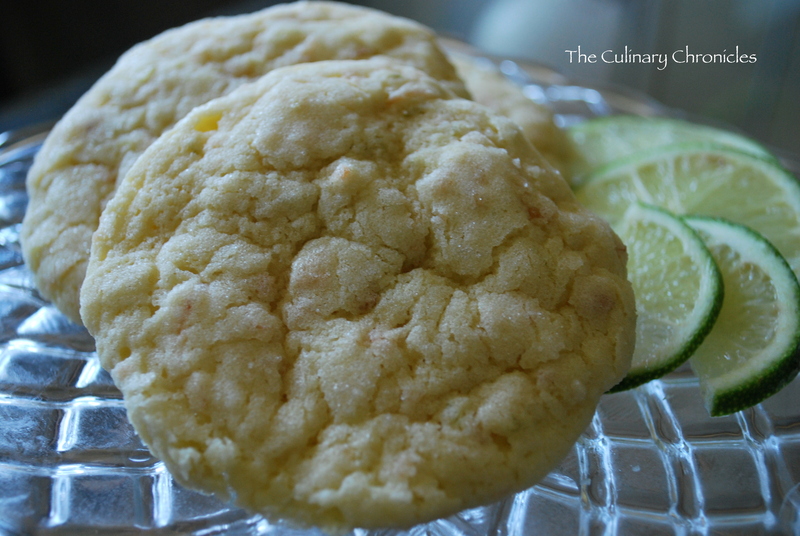 Imagine a fabulous sugar cookie….light, chewy, slightly crisp from the rolled sugar. And then add the rich flavors of coconut with the bright flavors of lime. Sound amazing? Well it sure was! Shame on me as I only made a half batch of these goodies–which I often do when testing out recipes. After all, butter isn’t cheap! But after one bite, I totally regretted it. <Sigh>….I guess I’ll have to make it again. Using a mixer, beat together the butter and sugar until smooth and very fluffy. Beat in egg, vanilla extract, lime juice and lime zest. Gradually blend in the dry ingredients and toasted coconut. yum!! these make my mouth pucker and water at the same time! great idea for a hawaiian or tropical themed party, too. That looks so good. I love sugar cookies and with the coconut makes it even better.